Today I’m welcoming Lee Roberts, executive producer and presenter of #haun7edLIVE. Thank you, Lee for stopping by! My name is Lee Roberts, I’ve been a Paranormal investigator for over 20 years now. I’ve ran private teams investigating private homes and local properties. Worked on a few TV shows including Mindscape, Ghost Attacks in the USA and worked with the Most Haunted team. I now run Haunted Events UK, write for Haunted Magazine and present #haun7edLIVE via my Facebook page. I used to be a police officer but left that role under a black cloud leading me to spend time in jail. That was the lowest part of my life but made me who I am today, I never regret anything in life. You’re the owner of the paranormal events company, Haunted Events UK. Share with everyone what your company’s about. I love meeting new people and sharing my experiences with others. I was asked around 8 years ago to run events exclusively for a location called Wollaton Hall, which was used to film Batman – Dark Knight Rises in 2011, the events were so popular Newstead abbey, Nottingham Castle and Sherwood Forest all asked me to do the same on an exclusive basis.. Haunted Events UK was born. I now also manage the bookings at a location called The Village in Mansfield, AMAZING location full of activity. Why the paranormal? Was it a personal experience that started it all for you? I was 6 years old, I was on a school trip at Newstead Abbey, a location I now work with. They were telling us the Ghost story of the white lady when my best friend collapsed. He said he felt like someone was pulling him into the ground. From that point I was hooked on the paranormal and began looking into all kinds of Ghost stories. It also coincided with the release of the original Ghostbusters film which was another reason. What’s your most frightening encounter with the ghostly realm? I was the main investigator at The Clifton Hall Hauntings back in 2008. The place was like the twilight zone, crazy activity, a room full of bees! Team mates collapsing and crying uncontrollably, dark figures showing themselves and more. You’re also the executive producer and presenter of #haun7edLIVE. Tell us about that. #haun7edLIVE came from a TV idea we had, the LIVE was supposed to be a spin off on Facebook but became bigger than we imagined. It’s basically 7 friends, all different backgrounds, abilities and experiences, what we all have in common is the love for the paranormal and enjoy having a laughs with it. 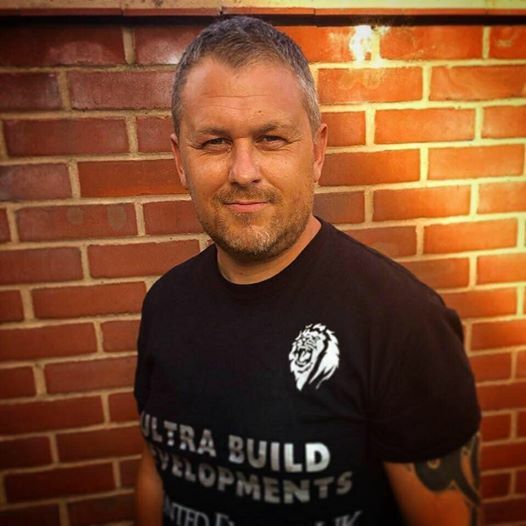 The team consists of Paul Stevenson editor of Haunted Magazine, Jason Wall, Pete Cox, Simon Powell, James Pykett & Andy Soar who is the designer for Haunted Magazine. We average around 1.5 million viewers at the moment and growing. Being a paranormal investigator, do you follow a certain routine while investigating and how do you protect yourself from anything negative? I like to go in blind, not know too much and start with a sweep of the full property. I never put any protection up. I’m very scientific minded and don’t believe in protection. If there are Spirits around us then they are there all the time, just because we are Ghost Hunting doesn’t make them any better or worse to require protection. Do you feel that all spirits are bad? Not at all, spirits were once living people, so you treat them as that. Some are good, some bad, some just grumpy old sods. Demonic entities are a different thing altogether. They were never living and are all bad. I still wouldn’t protect myself from them, but treat differently in my approach. Do you have any upcoming projects that you’d like to share with everyone? We have a Spirits of Winter special coming up, more on that will be announced soon. Also 2017 events are now on sale and selling very fast. Where can fans find updates about your shows and events? For the LIVE shows go to www.facebook.com/officailleeroberts for all updates and to watch live. Never live your life for others, don’t worry what others think. Believe in yourself and tell yourself you will be successful, believe that with all your heart and it will happen, you have to believe it for others, too. Paranormal wise, have fun, don’t take it too seriously and enjoy. This entry was posted in #haun7edLIVE, Executive Producer, Facebook, Ghost Hunter, Ghosts, Hauntings, Interview, Law Enforcement, Lee Roberts, Paranormal, Paranormal Activity, Paranormal Investigators, Presenter, Supernatural and tagged #haun7edLIVE, Executive Producer, Facebook, Ghost Hunter, Ghosts, Hauntings, Interview, Law Enforcement, Lee Roberts, Paranormal, Paranormal Activity, Paranormal Investigators, Presenter, Supernatural by SheilaReneeParker. Bookmark the permalink. Happy to share this interesting interview with you. Sheila Renee Parker talks with Lee Roberts, a Paranormal Investigator. I am always intrigued with investigators like this. And had the opportunity to do the same work many years ago. But after much inward searching (and conversing with my Spirit Team) I decided to leave it completely alone. However, I have much respect for Mr. Roberts. I do have one sticking point: he believes in NOT protecting himself. I have a very strong disagreement with him on this point. There are very good ways to protect yourself in these situations (that I will outline from 37+ years of spirit communication experience as a medium, in my own post in the coming days — so watch for it) without interfering with contact and recognizing essence. You can still be wide open while investigating. Enjoyable interview. I love to hear a paranormal researcher say “Don’t take it too seriously.” I like to have fun with paranormal subjects, too.